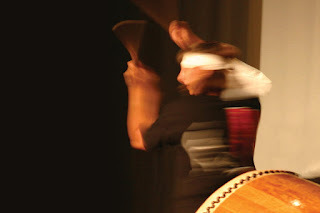 Cherry and Spoon: Fringe Festival 2016: "Restless Beat: A BIG DRUM Musical"
Fringe Festival 2016: "Restless Beat: A BIG DRUM Musical"
Highlights: I love taiko drumming (see also Mu Daiko), and I love musicals. Combining the two is a new concept, and sounds like great idea. The drumming part of this show is stronger than the musical part; the story is a bit cliche (two characters that hate each other end up liking each other, a drummer leaves the big powerful group to play with the noble underdogs, a domestic abuse storyline that doesn't really go anywhere). But the drumming is great, with that powerful taiko feel, the songs (written/arranged by Brett Diethert) are well suited to the emotions at each point in the story (an angry song, a flirty song, a celebratory song), and the cast (Benjamin Mayo, Brynn Berryhill, Christopher Hager, Kezia Germ, Sam Aanestad) does a nice job navigating the the transition from drumming to scenes and staying consistent throughout.